Minford’s Kelsey Conkey (back row, middle) was named as the River States Conference’s Player of the Year in 2017. Conkey went 22-2 with a 0.94 ERA in the circle and batted .331 at the plate with 14 home runs and 53 RBI during her redshirt sophomore campaign. Former Minford High School graduate Kelsey Conkey has accumulated a 41-7 overall mark as the ace of Rio Grande’s pitching staff. Conkey has collected an ERA of under 2.00 in each of her first two seasons of play with the RedStorm. In the world of sports, there are great players. However, on occasion, there are players that are so dominant that they stand out on an island or in a league of their own. Throughout her high school and college career as a softball pitcher, Minford native Kelsey Conkey has proven to be that kind of talent as a star two-way player for not only her native Falcons, but most recently, Rio Grande, where the redshirt junior-to-be has put up numbers that would make even the strongest of opposing batters cringe. After putting together arguably the greatest career in the history of the Minford High School softball program by collecting four consecutive First-Team All-SOC and All-Southeast District accolades, along with three straight Division III All-State honors, Conkey has parlayed that success into a wonderful softball career at Rio Grande that includes an astounding pitching record of 41-7 — including a stellar 22-2 mark in 2017 as the ace of the circle for the RedStorm. So where has this success — and penchant for winning — come from, you ask? A strong support system, according to Conkey. 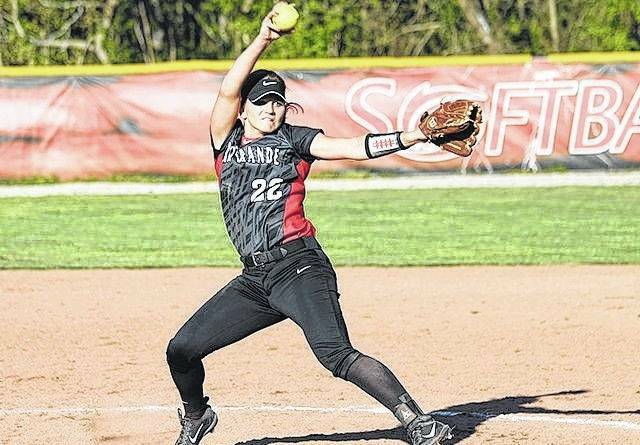 Over her four year career at Minford, Conkey, a 5-8 pitcher who also excelled at shortstop for the Falcons, proved to be brilliant for Preston Messer’s Minford club. In fact, throughout the duration of her career, Conkey was able to post a batting average north of .400 in every season and exceeded .450 in each of her final three years of play — all while posting an earned run average of 2.25 or less in each season of her high school career. Those numbers not only allowed Conkey to garner All-Southeast District and First-Team All-SOC II honors in each of her four seasons as a Falcon and All-State honors from her sophomore to her senior year, but also allowed Minford to establish itself as a tough out against its fellow district competitors as the Falcons advanced to district postseason play in three of Conkey’s four years at Minford. That penchant for winning, however, hasn’t stopped. In fact, since Conkey made her first step onto the University of Rio Grande campus in 2014, her success has only increased. After redshirting during her first season on the squad in 2015, Conkey combined with newly-hired head coach Chris Hammond — who went 16-8 in his one season at Jackson before moving up to the college ranks — to start a perfect storm of sorts for the RedStorm. Over the past two seasons, Rio Grande has gone an incredible 34-2 in River States Conference (RSC) action en route to back-to-back regular season and conference tournament championships during Hammond’s tenure. And throughout the past two years, Conkey has played an integral role in that success. In her freshman season, after entrenching herself as a top-two starter in the Rio Grande rotation, Conley tied or set team highs in wins (19), games pitched (25), complete games (17), batters walked (29), innings pitched (135.2), doubles given up (10), games started (21), and shutouts (five) en route to a 19-5 campaign that included an ERA of 1.65 and a strikeout-to-walk ratio of nearly 3.8-to-1 en route to leading the RedStorm to an NAIA National Tournament appearance. But as dominant as her freshman year was, her sophomore campaign proved to be even moreso. In fact, the Minford product did something that is rarely seen in any level of baseball or softball by nearly cutting her ERA in half as the redshirt sophomore collected a 22-2 record behind a blistering 0.94 mark despite upping her totals in games pitched (27), games started (23), complete games (18), and innings pitched (148.1), which were all team-highs for the second straight year. Conkey also added 10 shutouts, collected a 4.08-to-1 strikeout-to-walk ratio, and held opposing batters to a mere .184 at the plate en route to a banner year. Her all-around improvement, however, wasn’t just showcased in the circle. At the plate, Conkey improved from a .269 average with two home runs and 34 RBI in her redshirt freshman season to a .331 average with a team-high 14 home runs and 53 RBI in 2017. All of those accolades, in addition to Conkey’s character as a student-athlete off of the field of play, was too much to hold the Minford product back as Conkey claimed the River States Conference’s Player of the Year Award and obtained NAIA Second-Team All-America honors at season’s end. With the improvements that Kelsey Conkey has made to her overall game, it is certainly scary to see what the 5-8 standout could do as a redshirt junior. However, after coming within one game of the NAIA World Series, Conkey’s main concern is about helping her team reach newfound heights that have never been seen before in team history — not the personal stats.